BEDS 4 BATHS 3 GARAGE 2 Basement available! Choice Line $262,765 3,100 TOTAL SQ. FT. | $85/SQ. FT. Select Line $298,597 3,204 TOTAL SQ. FT. | $93/SQ. FT.
First Floor 2372 Sq. Ft.
Total Heated 2372 Sq. Ft.
Front Covered Porch 152 Sq. Ft. Optional Rear Deck 104 Sq. Ft. Optional Terrace Level 2372 Sq. Ft.
With its open floor plan, ample storage, and multiple bedrooms and bathrooms the Shoal Creek is ideal for growing and larger families. The kitchen features abundant cabinet space, a huge pantry, and an island that looks out into the large great room making this home the perfect place for entertaining and family gatherings! 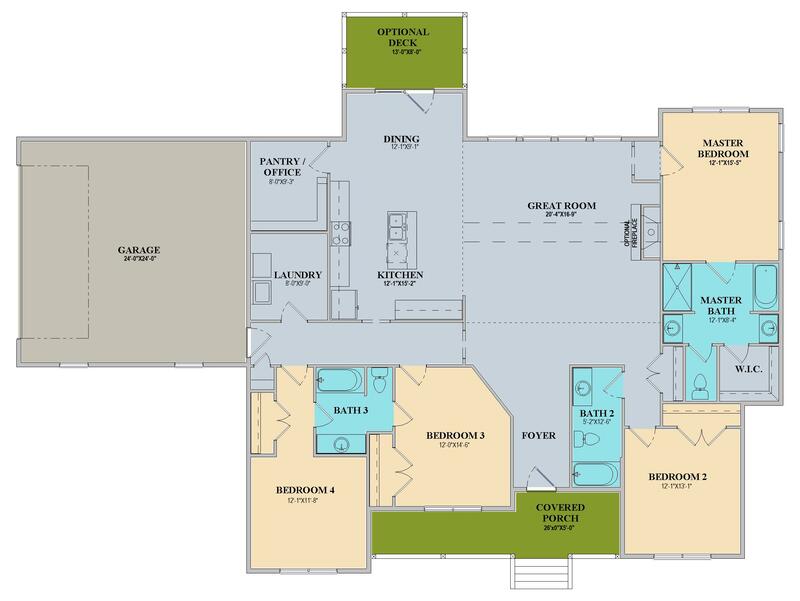 Check out the floor plan above to take in all the great features that the Shoal Creek has to offer! All Brown Haven Home plans include luxury finishes and superior products. The Shoal Creek single-family home plan is 3,100 square feet, has 4 bedrooms, 3.0 bathrooms, and 2 garage spaces. Starting from $262,765, the Shoal Creek home can be built “On Your Lot” in Ellijay, Georgia. Other nearby locations you can build a new Shoal Creek home include Gilmer County, Jasper in Pickens County, and Murray County, Georgia. In all, we build our award-winning custom homes in twenty-one Georgia counties. Similar custom homes in Ellijay you may love include the 2,715 square foot IvyLog plan, the LongView, a 2.5-bath home, and the 4 bedroom Claymore custom home.